Good to see you Rob! At least three other young women have disappeared in the area in the last five years. Nineteen-year-old Samantha Ann Clarke, who vanished after leaving her Orange County town house in September 2010, and 19-year-old DaShad Laquinn Smith, who disappeared in Charlottesville in November 2012, remain missing. Morgan Harrington, a 20-year-old Virginia Tech student, disappeared from the University of Virginia's John Paul Jones Arena while attending a rock concert in October 2009. Her remains were found three months later in a rural area. No arrests have been made. Police have said they do not think Graham's disappearance is linked to any of the other missing women. But Emily Kilroy, a consultant who also helped search Saturday, said the episodes are "starting to feel like a pattern" that's especially unfortunate in a college town with so many young women. Well, they have arrested Graham in Texas. Let's get that DNA and see what it matches. The mother of Morgan Harrington tells CBS19 there is a forensic link between the investigation into her daughter's death and the Hannah Graham case. Harrington went missing in 2009 after attending a concert at the John Paul Jones Arena. Her body was found a few months later at a farm in Albemarle County. No one has been charged with her death. Gil Harrington tells us, Virginia State Police recently informed her of the link to the Graham case. 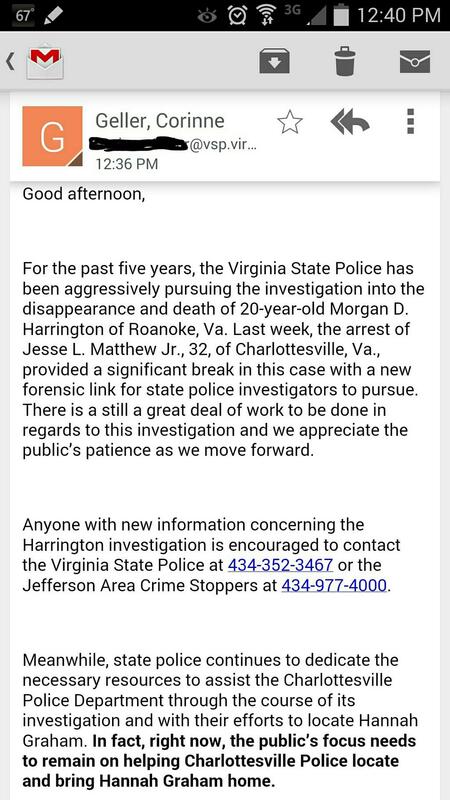 "For the past five years, the Virginia State Police has been aggressively pursuing the investigation into the disappearance and death of 20-year-old Morgan D. Harrington of Roanoke, Va. Last week, the arrest of Jesse L. Matthew Jr., 32, of Charlottesville, Va., provided a significant break in this case with a new forensic link for state police investigators to pursue. There is a still a great deal of work to be done in regards to this investigation and we appreciate the public’s patience as we move forward. Sources have confirmed for NBC12 that forensic evidence links the accused abductor of missing UVA student Hannah Graham to the case of missing Virginia Tech student Morgan Harrington. Virginia State Police spokesperson Corinne Geller sent a statement Monday afternoon acknowledging the link and encouraging the public to continue to focus attention on helping Charlottesville police find Hannah Graham. For the past five years, the Virginia State Police has been aggressively pursuing the investigation into the disappearance and death of 20-year-old Morgan D. Harrington of Roanoke, Va. Last week, the arrest of Jesse L. Matthew Jr., 32, of Charlottesville, Va., provided a significant break in this case with a new forensic link for state police investigators to pursue. There is a still a great deal of work to be done in regards to this investigation and we appreciate the public's patience as we move forward. JUST IN: From Dan Harrington on #JesseMatthew link: "We're relieved in one sense, but very sad in another as it's taken another tragedy.."
Muffy,thank you so much for the updates! I'm hoping there will be justice for Morgan and her family. VSP confirms #HannahGraham #JesseMatthew #MorganHarrington link on the record. Same day #JesseMatthew was accused of sexually assaulting woman-October 17, 2002- is same day #MorganHarrington went missing 7 years later. Significant break in #MorganHarrington case. #VA State Police say new forensic link. Gil Harrington says it links to #JesseMatthew. 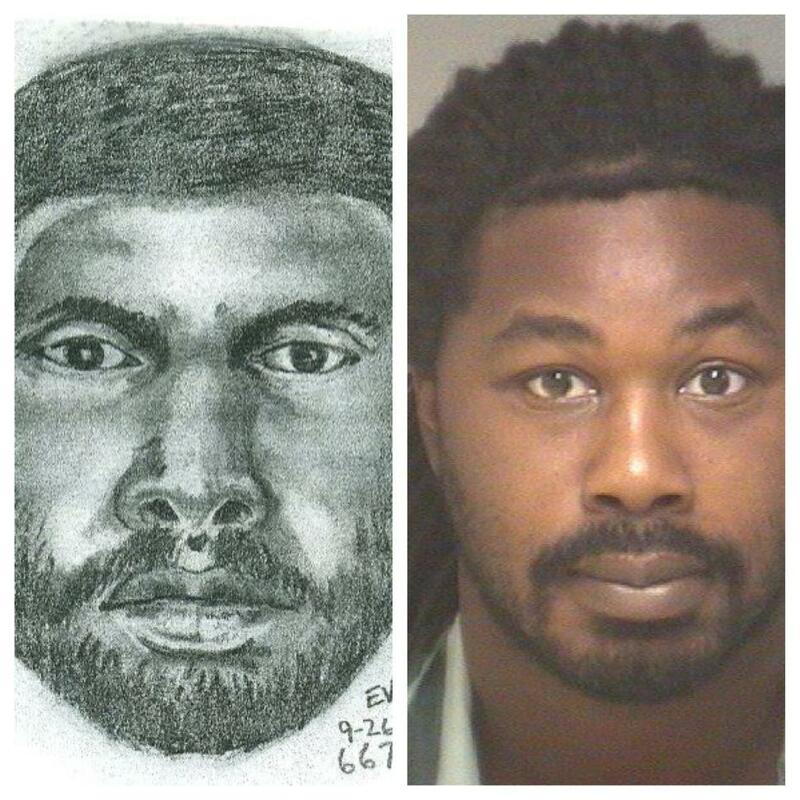 #BREAKING: Forensic evidence from #JesseMatthew linked to #MorganHarrington murder. I founded the KlaasKids Foundation in 1994, to give meaning to the kidnap and murder of my 12-year-old daughter, Polly Hannah Klaas, in Petaluma, California. Virginia State Police investigators said Monday that the arrest of Jesse L. Matthew Jr., who allegedly abducted U-Va. student Hannah Graham, has provided “a significant break” in the case of a young woman who disappeared in Charlottesville in 2009 and was later found dead. Police said Matthew’s arrest last week has given state police investigators forensic leads to pursue in the abduction and slaying of Virginia Tech student Morgan Harrington, 20, who went missing in Charlottesville five years ago. Harrington’s body was found in a field 10 miles south of town 101 days after she disappeared from a Metallica concert at a U-Va. basketball arena. Charlottesville Police allege that Matthew abducted Graham in the early morning hours of Sept. 13, and Graham has not been heard from since. Extensive searches for Graham thus far have turned up almost no trace of her since she appeared on video surveillance on the Downtown Mall shortly after 1 a.m. that Saturday. Police and other law enforcement officials would not disclose what evidence they have or how it might be linked to Harrington’s case, but any connection between her disappearance and Graham’s could indicate what many in the U-Va. community have feared: That an attacker has, over a span of years, preyed on young, vulnerable women on the state’s flagship public campus. The article below is dated July 2, 2010. I wonder how many crimes is this man responsible for?! Virginia State Police said only that there is a forensic connection between the two unsolved cases, but the sources said DNA evidence links them. That means police have a description and a composite sketch of a man they call a "person of interest" in the disappearance and death of Harrington, 20, who was last seen Oct. 17 outside a Metallica concert at the John Paul Jones Arena at the University of Virginia. Her body, the bones shattered, was found months later in a remote field of an Albemarle County farm about 10 miles from the arena. Harrington's parents, Dan and Gil, said Thursday that they are convinced someone knows or recognizes the face of the man they think killed their daughter, an education major who wanted to be teacher. A $150,000 reward is being offered in the case. "He's there. He's hiding in plain sight," Gil Harrington said. "This puts us closer to getting this obscenity off the street. He did not kill the woman in Fairfax. He did kill Morgan. I want to get him off the street for the next girl." Police seeking the man's identity said they don't know where or how he came upon Harrington, but they are certain that he is the same person who attacked a woman who was walking home alone on Jermantown Road from a Fairfax City Giant on a Saturday night nearly five years ago. It was about 10 p.m. Sept. 24, 2005, when the man grabbed the 26-year-old woman from behind and dragged her to a nearby pool outside the Oxford Row townhouses directly across the street from Lanier Middle School, police said. The man sexually assaulted the woman but took off running when a passerby came. Sources said the woman strenuously fought her attacker, and police at the time said he might have had scratches on his face. The woman described the man as black and about 6 feet tall. He had a medium build, short hair, and a moustache and beard. Officers said that his appearance might have changed in the past five years. "We're trying not only to identify him, but to determine what kind of contact he had with Morgan Harrington the night of her disappearance," Virginia State Police spokeswoman Corinne Geller said. Harrington, a music buff, left her parents' home in Roanoke about noon the day of the concert and headed to Charlottesville with friends. When she left the group to go to the restroom, she ended up outside the arena and couldn't reenter because she didn't have a ticket stub, police said. Just before 9 p.m. she called a friend and said not to worry and that she'd find her way home. Harrington was last seen about 9:30 p.m. walking alone on the Copeley Road railroad bridge near the arena. By that time she had a scratch on her face, but police think it was from a fall, not an attack. Her purse and cellphone were found the next day in a grassy lot used for overflow concert parking. In November, Harrington's T-shirt -- black with the name of the rock band Pantera spelled in tan letters across the front -- was found on 15th Street near Grady Avenue in an area heavily populated by students and just east of fraternities along Rugby Road. I bet that he never thought there would be any dna left to identfy on Morgan, after being out in the elements that long. He would never risk that again, so they need to be looking somewhere else for Graham and probably the rest of the girls missing in Charlottesville. 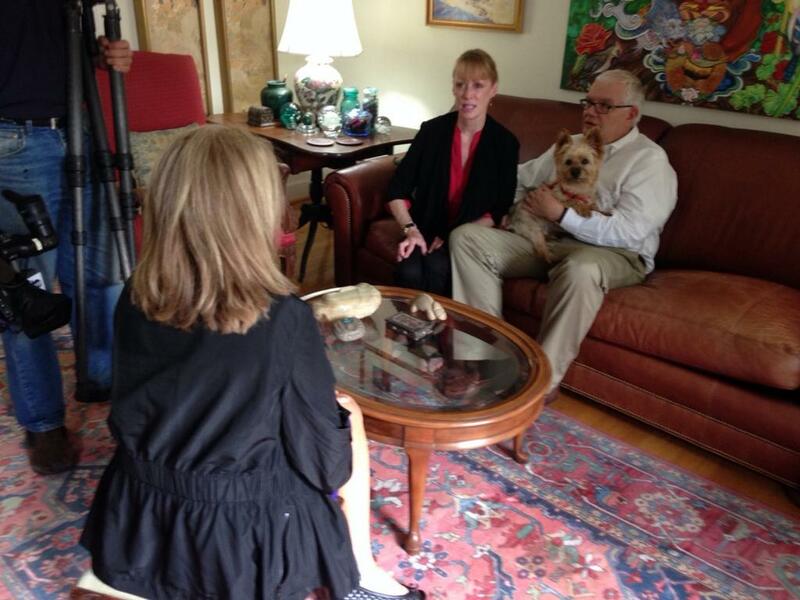 Gil and Dan Harrington, the parents of Morgan Harrington, talked to WDBJ7's Jean Jadhon on Monday. Earlier Monday, Virginia State Police confirmed a forensic link between Jesse Matthew, the suspect in the disappearance of Hannah Graham, and the Morgan Harrington case. "These women were not asking for it. They were stolen from us they were taken from us," Gil Harrington said. Gil Harrington said she's spent sleepless nights wondering if the person who killed Morgan would also kill again. "I'm relieved. If this is the person who killed Morgan. He is in custody and he's likely not to ever be able to harm another human being. I'm very pleased to know that," Harrington said. * Jesse Matthew accused of sexual assault at Liberty University on October 17, 2002. * Morgan Harrington went missing October 17, 2009. * Missing Orange County 19-year-old Samantha Clarke went missing September 13, 2010. *Missing UVA student 18-year-old Hannah Graham went missing September 13, 2014. This is Harrington's response about Matthew's connection to other missing girls: "I would not be surprised to hear that. I would be saddened but this is what predators do, they kill," Harrington said. Harrington reminds the community to keep focusing on finding Hannah Graham. Page created in 10.149 seconds with 19 queries.